The Witch and the Hundred Knight PS3 Review: Don't Call Her "Metallica"
Nippon Ichi's latest is something of a departure from its usual fare. Can the legendary power of the Hundred Knight calm the troubled soul of Metallia, the universe's most pissed-off witch? These days, I tend to find myself gravitating less towards the most high-profile, technically accomplished games that are all but guaranteed to vacuum up awards and critical acclaim, and more towards intriguing, interesting titles that are perhaps somewhat more flawed, but which always, without fail, spark some enjoyable discussions. 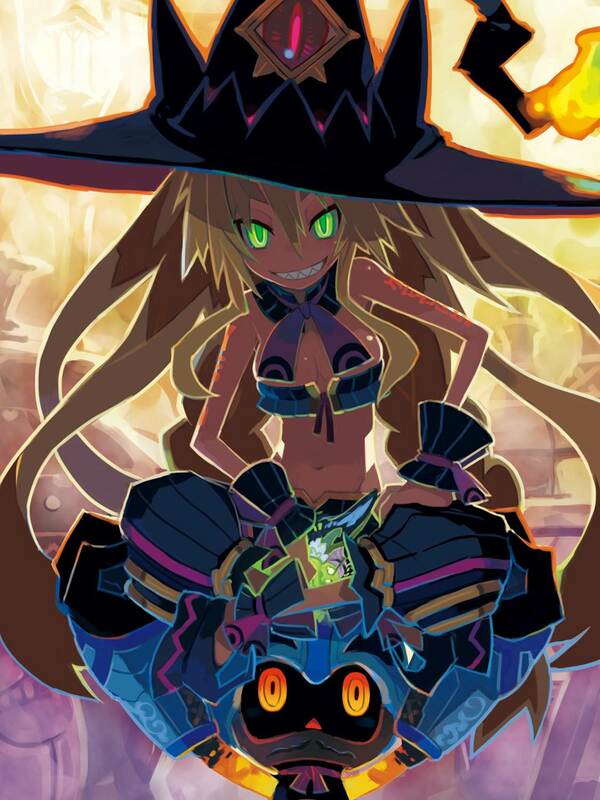 Nippon Ichi Software's latest title The Witch and the Hundred Knight very much falls into that latter category. It's not the best game you're going to play this year. It's not the best Japanese role-playing game you'll ever play. It's not even the best game Nippon Ichi has ever put out. But by gosh, it is interesting in so many ways, and that, for me, makes it an immediately worthwhile experience that I'm glad I've had. Unusually for a game of this type, you're free to attack townsfolk. Expect your reputation to suffer as a result, however. 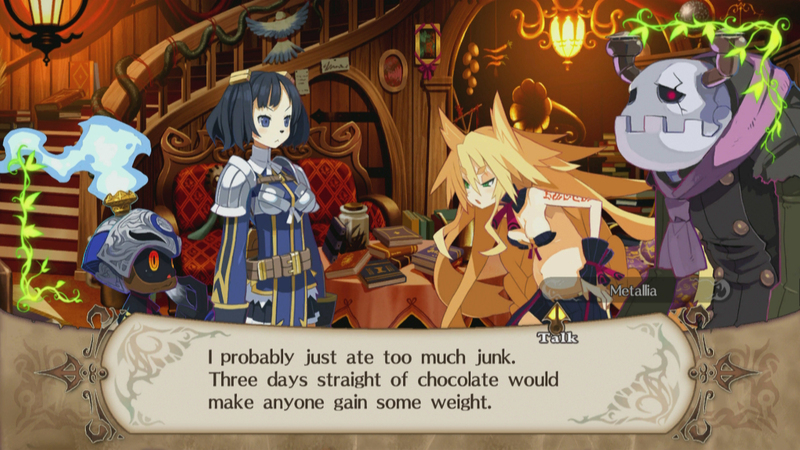 The Witch and the Hundred Knight is a fairly significant departure from Nippon Ichi's normal fare, both in terms of gameplay and its narrative content. 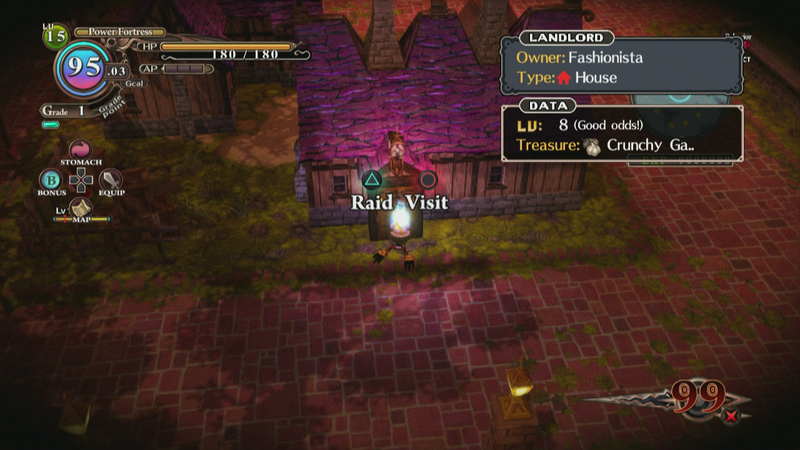 Rather than being a grind-heavy strategy RPG or a turn-based roguelike, it is instead a real-time hack-and-slash action RPG with some strong loot-whoring tendencies. And rather than providing a light-hearted, comedic story to follow, it offers a surprisingly dark narrative that some might even find initially offputting if they go in expecting another Disgaea. The game's narrative revolves around the eponymous witch Metallia (sadly rebranded from her original Japanese name Metallica for reasons that are probably obvious) and her attempts to dominate the world through judicious application of stinky swamp mud. 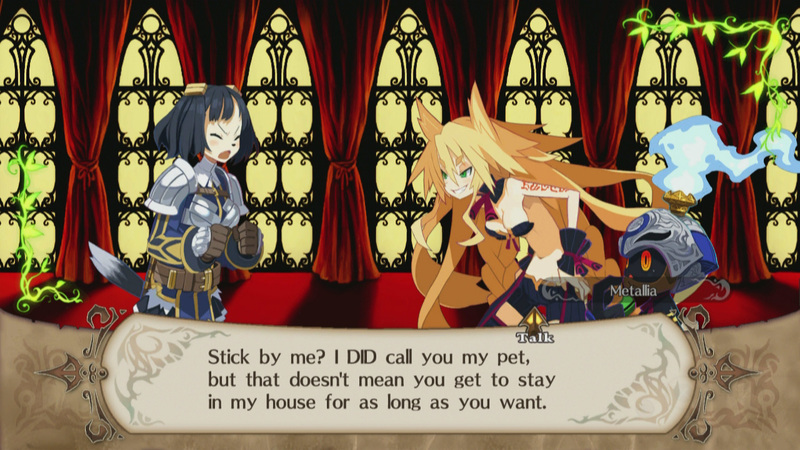 In order to spread her influence (and swamp), she summons the Hundred Knight, a legendary figure that actually turns out to be a rather pathetic-looking creature only capable of communicating through childish babbling. This is where you come in; taking on the role of the Hundred Knight, it's your job to go out into the world and "release" the Pillars of Temperance, allowing Metallia's swamp mud to flow freely into new areas. Metallia herself is set up to be a thoroughly nasty piece of work almost from the outset. She's rude, belligerent, aggressive, foul-mouthed and prone to irrational bouts of violence and torture. And not in the usual anime trope sort of way; she's no tsundere with a heart of gold -- she's out-and-out unpleasant. At least, so it seems for a significant portion of the early game; some players may find it difficult to engage with her as the story's main protagonist due to quite how objectionable she can be at times, but it's worth sticking with her -- over time, she gradually starts to show her hidden depths, and the fact that she is a much more complex character than she initially appears. It will probably not surprise you to learn that Metallia has plenty of issues, and they are both deep-seated and serious. The story as a whole gradually sees you learning more about the truth behind her, eventually leading towards the answers to several questions posed early in the game: why she can't leave her swamp without the Hundred Knight releasing the Pillars, why the other witches in the world won't acknowledge her despite her obvious power, and exactly what is going to happen when she claims, all too calmly, that she's going to die in a hundred days' time. The cast is a diverse bunch, ranging from the abrasive Metallia (right) to the passionate but honest Visco (left), who has been incompetently cursed to look a bit like a dog. Part of the reason for the narrative's slow pacing comes in the form of the fairly lengthy "game" parts that punctuate the story scenes. Unfolding as something of a cross between a Diablo-style loot-whoring action RPG on a series of predefined, non-random maps and Nippon Ichi's own roguelikes ZHP and The Guided Fate Paradox, setting out into the field in The Witch and the Hundred Knight sees you hacking and slashing, collecting treasures and trying to carefully manage your resources for the most efficient play. There's some downright peculiar systems at play that take a little adjusting to, it has to be said, and the game doesn't give up the secrets of its mechanics easily, despite the 50 different tips that randomly appear on the load screens between areas. For some, this will be a pleasurable experience; I found personally that discovering how the various game systems work for myself was considerably more satisfying than having everything served up on a tutorial platter to me. For others, though, they may prefer at least the option to look up information on what on Earth HP, AP, TP, GCals, Grade Points and Bonus Points are and what they're for. If you fall into the latter category, you may find The Witch and the Hundred Knight to be frustrating for your first few hours, but it won't be long before everything falls into place. As Metallia's servant, you're expected to exert her dominance over nearby settlements. It is, however, your choice as to whether you obey her will. 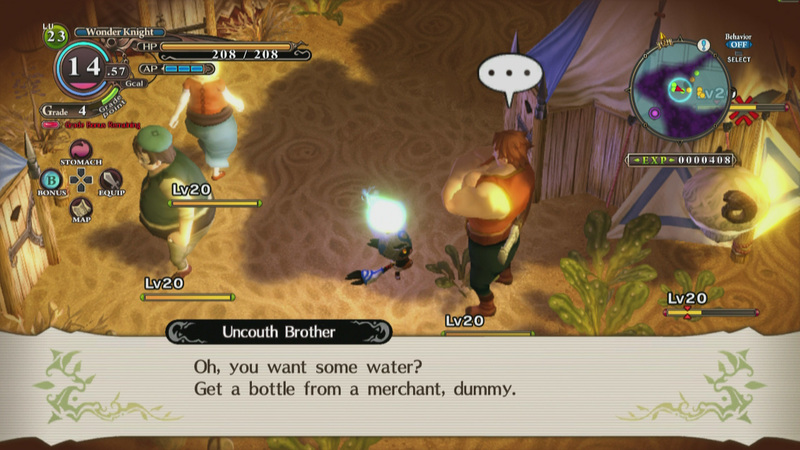 The Witch and the Hundred Knight isn't exactly up-front about some of its little quirks, so here's a few handy tips. Don't forget to use your Grade bonus points at a Pillar. Levelling up Attack means you can rip through the rest of the level quickly. You earn more Grade Points the more times you hit in a combo. Equip weapons that hit lots of times and attack enemies in large groups for big GP bonuses. Pay attention to the Magic Die symbols (the magic circles with yellow pips) when equipping weapons. Equipping weapons in die order -- wrapping around from 5 to 1 when necessary -- will mean you're doing double normal damage by the end of the combo. Put high-damage, slow weapons like hammers at the end of your five-weapon combo for even greater damage. Use your Tochka abilities when you have them. The one that allows you to summon minions is particularly useful; let them tank the enemy's attacks while you sneak in from behind. The Arrow Tochka can be fired out in a straight line, then bent back to hit a target like a boomerang if you lock on while it's in flight. Use this to hit seemingly unreachable switches. If you're coming up on a boss encounter and low on GCals, eat some regular enemies to restore yourself rather than leaving and losing your Grade bonus. If you're doing too much damage to knock them below the Consume threshold without killing them, swap out for a weaker weapon temporarily. You gain one Bonus level for every 100 Bonus points, which equates to one freebie item when you leave. The longer you stay in a level in one expedition and the more things you kill, the higher your Bonus points. This can be a great way of acquiring useful items quickly. This being a Nippon Ichi game, you will doubtless be unsurprised to hear that it is a min-maxer's delight, though not to quite as an obsessive degree as some of the developer's other titles. You can equip up to five weapons at once, each of which inflict Blunt, Slash or Magic damage, and equipping them in an order according to the "Magic Die" symbol on them provides bonuses to them when used as part of a combo. Different weapons handle noticeably differently from one another, and even within weapons of the same type there is variation. Some spears jab out in front of the Hundred Knight, for example, while others are designed to be whirled around his head to hit enemies in a wide area. Naturally, some enemy types are weak or strong against particular attack types, so it's in your interest to keep a wide array of different weapons on hand to equip as the situation demands. It's pretty straightforward to do this -- there's a controller shortcut to the Equip menu that prevents having to go through the menus, for example -- but the lack of an ability to save commonly used equipment sets can make the process a little more cumbersome than it needs to be, particularly when running through areas that feature types of enemies with opposing strengths and weaknesses. The Hundred Knight also earns new "Facets" as you progress through the game, each of which has its own set of specific weapon proficiencies; by the time I unlocked these, however, I found that the well-balanced "Wonder Knight" facet was more than powerful enough to take on pretty much anything, meaning the other facets tended to be relegated to little more than stat-buffers, since two can be equipped as passive "Sub Facets" at any one time. The ZHP comparisons come in with the game's odd levelling system, which ties in to the aforementioned Facets somewhat. You earn experience as you hack and slash through enemies, yes, but you don't actually "get" any of that experience applied to your equipped Facets until you complete or leave the area having discovered at least one of the checkpoints. Instead, alongside experience, you earn Grade Points through kills and combos. These contribute to a Grade Level, and every time you earn a Grade Level you earn a single point which can be spent at a checkpoint for a temporary buff to attack, defense, HP or a few other stats during that one expedition. In other words, you can earn temporary "level ups" over the course of a single jaunt into a dungeon through the Grade system, and your base stats will improve permanently at a slower rate over time through the more conventional levelling system. It initially seems complex and confusing -- thanks largely to it not being explained at all well by the game -- but once you get your head around it, the reason for it being like this becomes clear, particularly when combined with the game's "GigaCals" system. The Hundred Knight runs on GigaCals, which reflect how much magical energy it has and act similarly to the hunger bar in ZHP. There's a constant, slow GCal drain at all times, but this rate is increased with everything you do, whether it's mapping unexplored areas, recovering stamina from running or attacking, or recovering health from being damaged. GCals can be replenished by either eating enemies -- which fills the Hundred Knight's stomach with Garbage items, reducing the amount of space for treasures to take home once you leave the area -- or by spending the precious bonus points from Grade Levels, which potentially denies you some useful stat buffs. If the Hundred Knight runs out of GCals, it is significantly weakened, cannot heal itself and will be sent home with half XP if it gets knocked out, so it's in your interest to ensure that doesn't happen. At the same time, however, you want to try and ensure you earn as many Grade Levels as possible in a single run to ensure you're powerful enough to take down the area's boss, so these interlocking systems actually combine to make a rather intriguing and elegant risk-reward mechanic. The boss fights tend to conclude a run through one of the game's lengthy, sprawling areas. These confrontations are often very challenging, requiring careful observation of attack patterns and understanding of the game's core mechanics, particularly with regard to damage types. They're much more than outright hack-and-slash slugfests, too; a fluctuating "Guard" bar beneath the boss' HP meter shows not only when is the best time to attack for decent damage, but also when the boss is about to unleash a powerful attack. Combat becomes about positioning yourself carefully so that you aren't hit with the attack in question, but you are able to inflict as much damage as you can. There's always a way to do this, and none of the bosses feel like they're making use of cheap, unavoidable attacks -- though there is one major battle partway through the game that occasionally temporarily makes use of some appalling camera angles and makes life a little difficult. This particular sequence is one of the odder episodes in the game's narrative. Ultimately, The Witch and the Hundred Knight is a lengthy, challenging and demanding game that may not offer a lot in the way of instant gratification, but becomes more rewarding and enjoyable -- both in terms of narrative and mechanics -- as you progress. It spins an unconventional, surprising and, at times, morally ambiguous tale, and complements this with some surprisingly deep hack-and-slash combat and challenging boss confrontations that bring to mind some of the best encounters of the 2D top-down SNES era. Its complicated interlocking game systems and initially abrasive protagonist will doubtless prove to be a turnoff for some players, but for those willing to invest some time and give Metallia the love she clearly most desperately needs, there's a lot to like here. Visuals: The 2D art is beautiful, stylized and visually distinct from Nippon Ichi's other titles. The 3D art is muddy and blurry, but it serves its purpose without being offensive. Music and Sound: A fantastically quirky Disgaea-style soundtrack often provides stark juxtaposition to the somewhat dark tone of the plot; voice acting comes in both English and Japanese varieties, with the latter being particularly strong. Interface: The game bombards you with a lot of information at once and it can take time to understand what it's telling you, but once you learn to parse it, you'll appreciate how much information you have to hand. Lasting Appeal: The main quest is a lengthy affair likely to take you at least 40 hours or so, and there's three endings to pursue. With trophies tied largely to progression rather than hunting down secrets, there's probably little reason to replay after you've beaten it, but a single journey through Metallia's story provides plenty of value. 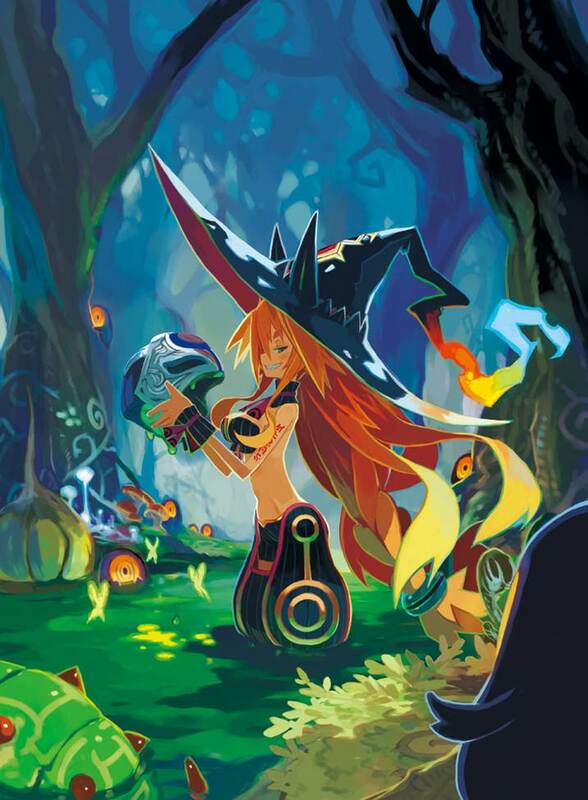 While far from Nippon Ichi's best game, The Witch and the Hundred Knight's interesting interlocking game systems and unconventional, dark narrative make it an enjoyable affair well worth spending some time with, assuming you have the patience to deal with its quirks along the way. Tagged with nipponichisoftware,	nisamerica,	PlayStation 3,	PlayStation3,	Reviews,	Role Playing Games.